This article applies network analysis tools to letters written by and about English Benedictine nuns living in Brussels during the seventeenth century in order to demonstrate the ways in which such an approach expands our picture of early modern religious communities, makes visible the protagonists of religious controversy, and advances debates about enclosure and anonymity. The dataset for this network analysis is taken from the RECIRC project database (the project is entitled “The Reception and Circulation of Early Modern Women’s Writing, 1550-1700” http://recirc.nuigalway.ie/). The RECIRC project is producing a large-scale quantitative analysis of the ways in which women’s writing was received and circulated in the early modern English-speaking world; its database will be open-access from the project’s close. The project has captured reception data on a range of female-authored sources, including texts produced in English convents established in Europe during the sixteenth and seventeenth centuries. The metadata extracted from the nuns’ letters that form the basis of this study have generated 1,188 reception records, each tracing a connection between a female author and a receiver. 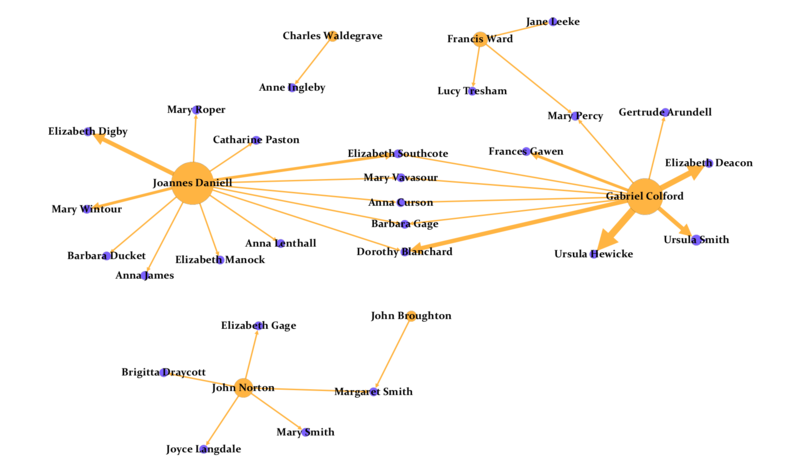 Network analysis is shown here to illuminate debates about the nature and extent of enclosure imposed upon early modern nuns, as well as the sheer breadth and diversity of their epistolary relationships. Furthermore, it exposes otherwise invisible protagonists in religious controversy, and progresses methodological debates about the presentation of data relating to anonymity.